Several huge areas of public lands are designated for exclusive unlimited OHV use to satisfy the need for recreational oppertunities of this special intrest group. How much land has the BLM set aside for equestrian and pedestrian use? There is currently less than 1 mile of dedicated trail for pedestrain and equestrian use within the Juniper Sub Region. It originates at the Bowen Ranch parking area and ends at the USFS boundry. Compare that with a proposed 98 miles of designated open motor vehicle routes within the same BLM region and one can see the equality of access for different intrest groups. The WEMO plan has everything for the OHV community and nothing for anyone else. Katrina may be interested in how the decision tree process for Cottonwood Springs was altered from a previously published one just 2 weeks after the BLM biologist left, leaving the process dictated by Mike Ahrens and Howard Johnson. Does it make sense to put an exclusive single track vehicle route through the heart of a protected riparian and cultural area? What happens when dirt bike meets horse with rider on trail? This issue has nothing to do with private property and everything to do with providing the public a refuge from the whine of the internal combustion engine. 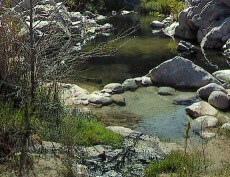 Cottonwood Springs is the perfect place for a little solitude.